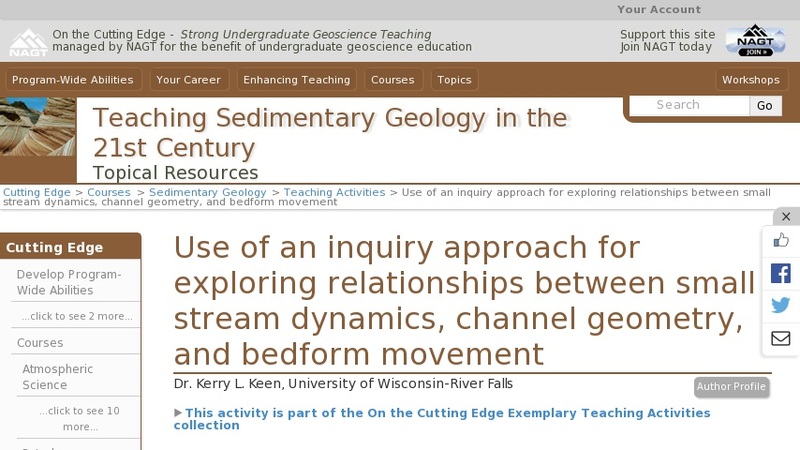 Open-ended, field, inquiry projects can be very useful in sedimentary geology courses to explore dynamic relationships in sedimentary systems. I have used this approach to allow students to "do" their own science in a small stream near our campus. These projects generally involve studying relationships between the nature of stream flow, stream dynamics, geometries of the channel, and characteristics and rates of movement of bedforms. The small-group inquiry project begins with students observing a section of the stream (located a couple miles from campus), followed by brainstorming questions about the features observed in the stream and on its bed, then to designing and implementing experiments to answer specific questions that they have formulated, and concluding with data analysis and student presentations of their research. Approximately a dozen steps comprise the complete inquiry approach.